Keith Haring: A Return To His Radiant Roots Keith Haring arrived in New York City in 1978. Bowled over by the sounds and sights of the city and its burgeoning hip-hop scene, he created a street-art aesthetic that brought him success in just four years. Now, a new exhibit at the Brooklyn Museum showcases rare drawings from those early ears. 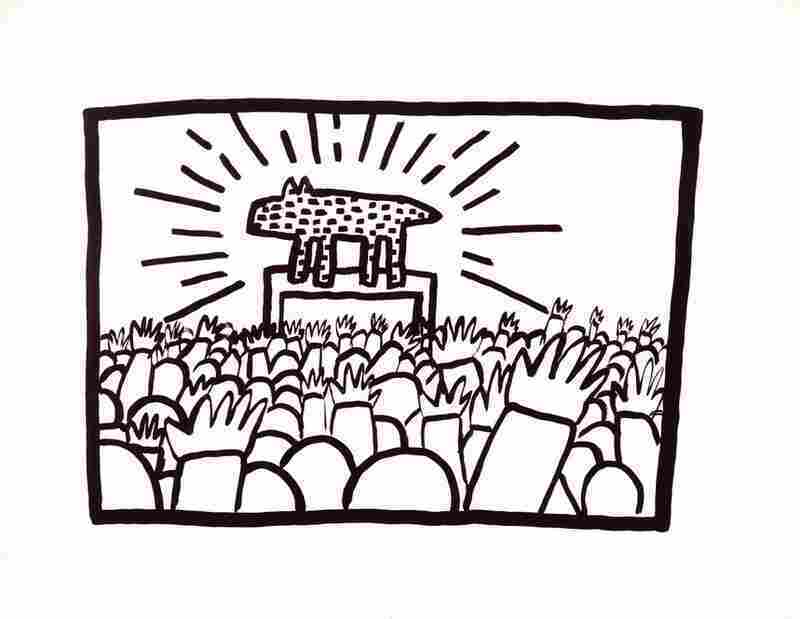 Keith Haring has come home. A new exhibition at the Brooklyn Museum focuses on the late artist's work at the beginning of his career, from his arrival in New York in the late 1970s, through his rise to international fame four years later. The show features rare early drawings Haring made as a young art student from Kutztown, Pa., bowled over by the sights and sounds of New York City. "When I first got here in '78, the trains and the art on the trains — the full cars — was sort of at an incredible peak," Haring recalled in a 1983 interview. "And there was — you could go in the subway for 15 minutes and see better art than you could see all day long in the gallery." Haring would listen to Kraftwerk and Devo on his headphones while drawing, for hours on end. Haring was floored by the hip-hop scene that was beginning to flourish in the city — break dancers, rappers, DJs and graffiti artists who turned the subway cars into enormous canvases. It inspired him to create his own graffiti — simple, cartoonish figures in motion, set off by radiating lines. And then, Haring had a breakthrough: He discovered the empty panels on the subway station walls, where the Transit Authority had put black paper over old advertisements. 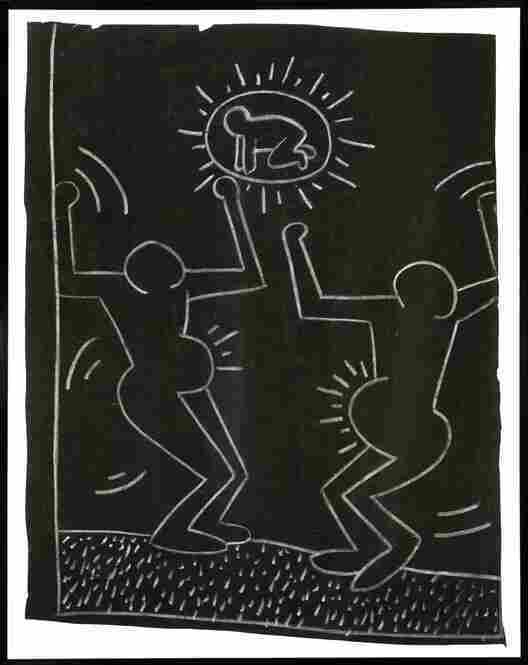 "When I first saw the first one, I just immediately went up aboveground and bought chalk, and went back down and started drawing," Haring remembered. "And after a certain point, it became less of a hobby and became a responsibility, because people were waiting to see them. 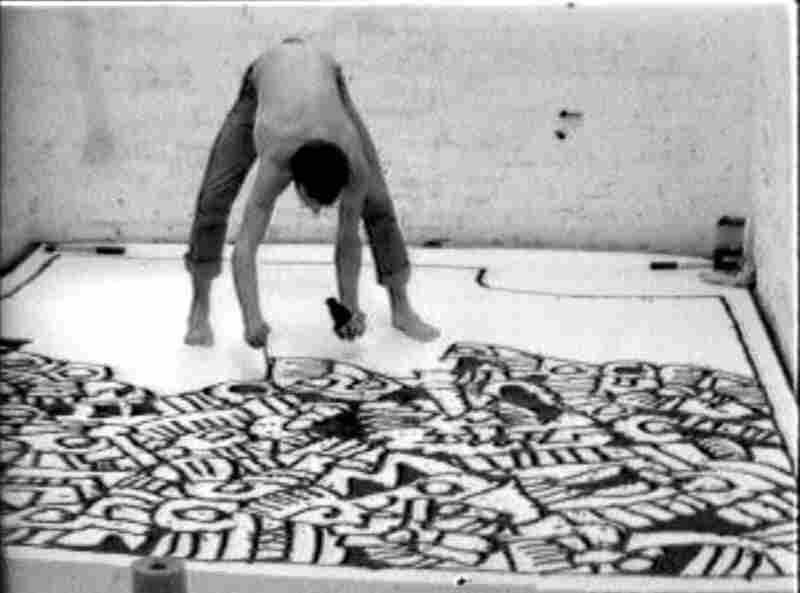 Haring ended up drawing almost 40 panels a day, two or three times a week. 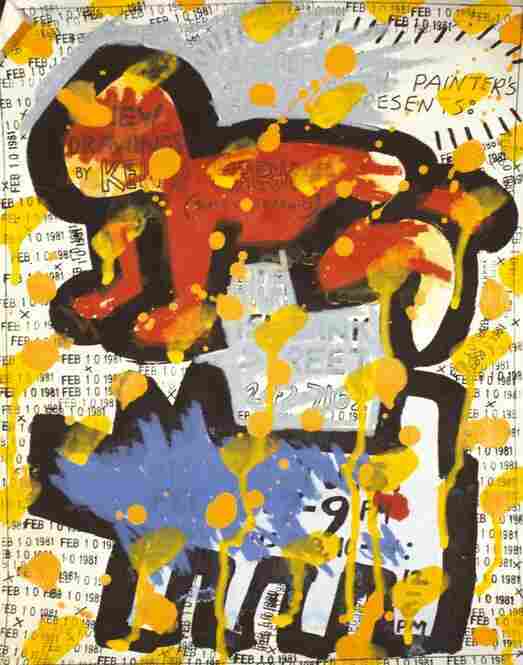 Each drawing only stayed up until a new ad was pasted over it — but that didn't bother Haring. "After a certain number of people have seen it, it's already fulfilled its purpose, really. Especially in the subway, because thousands of people go past them every day. So even if it's only up for one day, it's already been seen by enough people to justify its existence, or justify the time I spent making it," he said. 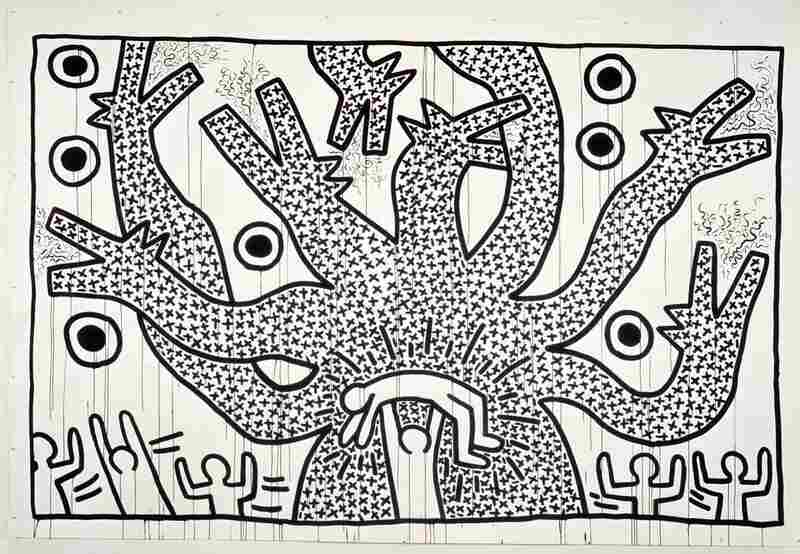 Haring worked fast — just a few minutes for each subway drawing — to avoid being caught and arrested for vandalism. Along the way, he created a lexicon of images that became famous around town: barking dogs, break dancers, UFOs, boomboxes and his signature tag — a person crawling on all fours. That image eventually morphed into a baby and was labeled the "radiant child," or "electric baby." These works were never meant to be collected, but many people saw them. And some people took them, says Brooklyn Museum curator Tricia Laughlin Bloom. "I think sometimes, if it hadn't been on too long, just a putty knife around the edges, you could pop it off," she says. "Other cases, you can see the drawings got torn in the process of getting extracted." Gallery owners and museum curators began to take note. "I only saw him in action once," says curator Elisabeth Sussman, who put on the last big Keith Haring exhibit in New York, 15 years ago at the Whitney Museum. "I can say that the vitality and the immediacy of the way he worked, and the focus of it, was truly extraordinary." 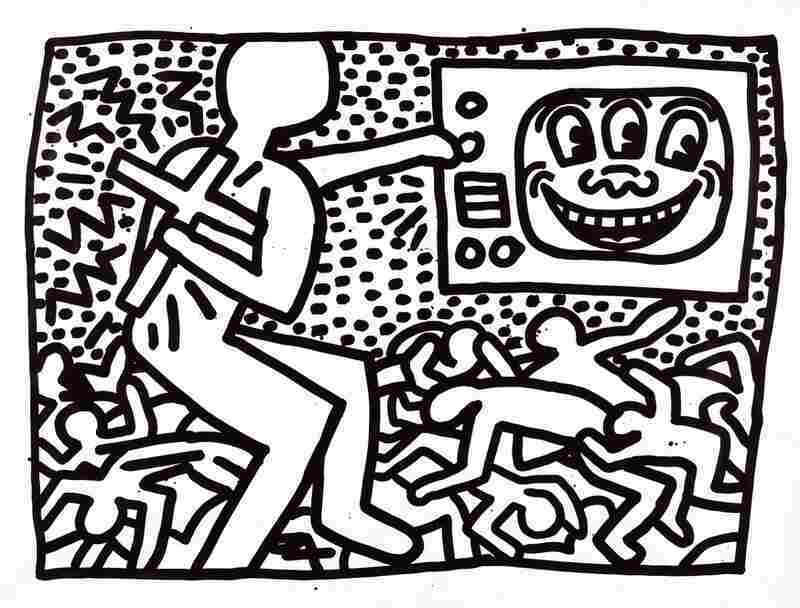 When he got a commission, Haring would slap on a pair of headphones, crank up the Devo or Kraftwerk on his Walkman, and draw for hours at a time. "He would just go all out," Sussman says. "So it wasn't a prim and proper installation that you might have seen in SoHo. Minimalism, or post-minimalism — something you know, high-minded and conceptual. It was all out. And it was painted on tarps, and it was hung salon-style, top to bottom. Every inch of the wall was covered. It just seethed with vitality." 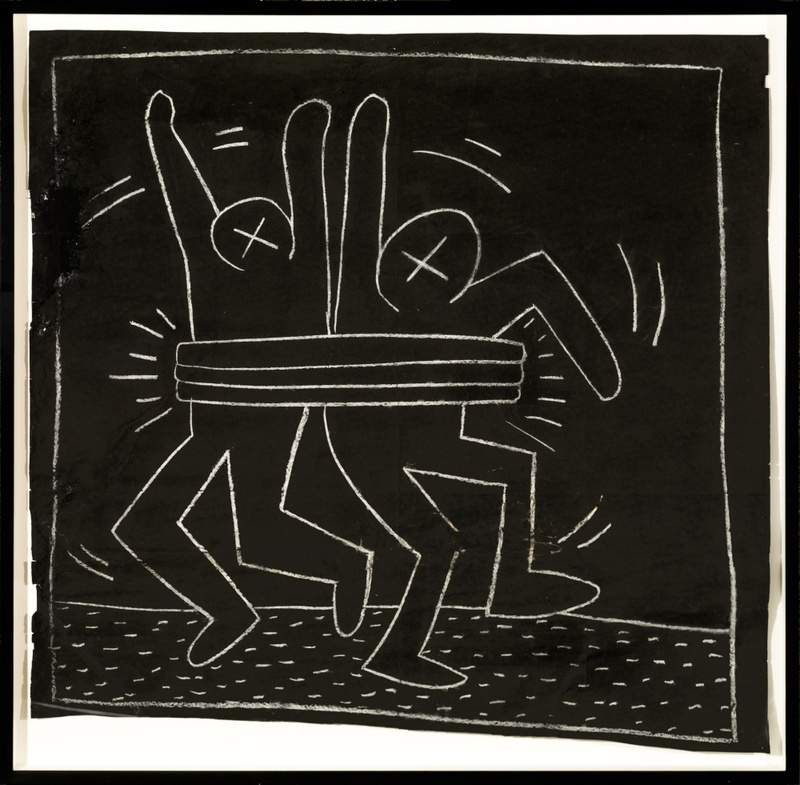 The new exhibition in Brooklyn combines all those aspects of Haring's work. There are 31 of his unsigned subway drawings on loan from private collections, and there are scores of larger works, like an enormous black and white piece called "Matrix," 50 feet long and 6 feet tall, covered with interwoven human figures, dogs, babies, brains and television sets. Untitled, circa 1980-1985, chalk on black paper. These subway drawings were visible only until the Transit Authority covered them with new advertisements — but many enterprising collectors managed to pry them free and save them. Haring's street aesthetic was a breakthrough in the art world of the early 1980s. Sussman says that street art, murals and populism can be taken for granted, almost expected of modern artists. 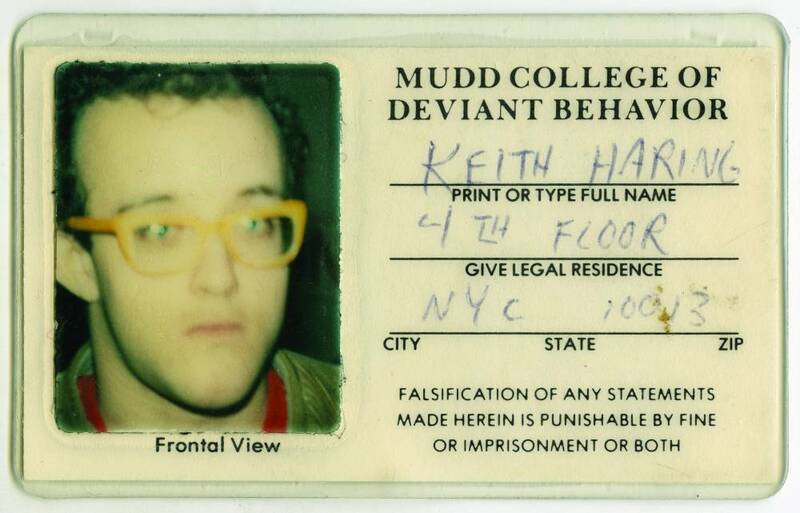 "But that has a history that begins with Keith Haring." Haring himself had mixed feelings about showing his work in established venues. Just after he turned 25, he was hanging two big murals in the Whitney Museum's Spring Biennial — he had officially arrived. But he was also taking the time to make drawings in the Lexington Avenue subway. "It's still, in some ways, the most pure situation, for someone coming across and running into it, and not knowing where it came from and how it got there. Or if it's even supposed to be art," he said at the time. Haring said that above all else, he just wanted to create art that surprised people. He died of complications of AIDS in 1990. He was just 31 years old.